Is business gamification a fad or can it improve employee engagement, boost productivity and increase operational performance? While businesses are rapidly investing in digital technologies to accelerate digital transformation initiatives, implementing a transformation program can be challenging and prone to failure. Research suggests that almost three quarters of business transformation projects fail 1. This is often due to poor employee engagement, cultural resistance to change and a lack of strong management involvement. Employee engagement is certainly an increasing challenge for organisations. In Deloitte’s Human Capital Study 2 87% of organisations cited culture and engagement as their top challenges. Meanwhile, according to Gallup, only 13 percent of the global workforce is “highly engaged” 3. And with Millennials set to make up 50% of the global workforce by 2020, and 75% by 2025, organisations are also having to rethink how best to communicate, engage and motivate this new generation of workers. 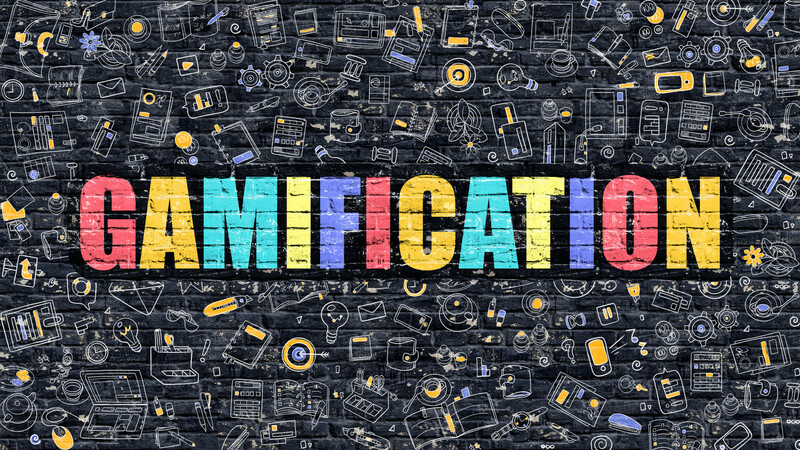 One approach that is emerging as an effective tool for improving employee engagement and communication in today’s digital workplace is gamification. Gamification is the application of game design techniques and mechanics to non-game activities to engage users and encourage participation with a product or service. The basic principles of gamification have been around for some time as a way to increase customer engagement – think frequent flyer cards, loyalty schemes and healthcare fitness programmes. Gamification techniques tap into and influence a person’s natural desire for competition, achievement and recognition. According to Gamification by Design co-author Gabe Zichermann, “gamification is 75 percent psychology and 25 percent technology.” Effective gamification combines focus on both extrinsic motivators (badges, points, leader boards) and intrinsic motivators (status, achievement and collaboration). Games give us positive feedback on our actions and achievements, can help create social connections and make learning more engaging. And obviously, games are fun – adding a game element to a mundane task – can be extremely effective. Think using a FitBit to measure steps and earn badges when milestones are reached. As such, gamification can prove effective in the workplace as an employee engagement tool, rewarding a user for completing specific challenges and accomplishments. By engaging multiple users in a product or service, a community is created which in turn can motivate users to contribute to a project at a higher level. Let’s consider a typical mundane office task – printing. Many business processes still rely on printing – yet wasteful printing leads to escalating costs – both financial and environmental. Today, a basic approach to gamification is being applied to support change management in managed print services (MPS) contracts. Borne out of Xerox Research Centre in Grenoble, the Xerox Print Awareness Tool 5 was launched in 2014 with the objective of lowering print usage and ink and paper consumption. The aim was to engage, educate and enable employees to print more efficiently. The tool, illustrated by a green daisy where petals turn grey as pages are printed, provides an interactive dashboard to show individual print usage. It provides real-time information about employee print behaviour and quickly identifies opportunities to improve efficiency. After a self-assessment of printing habits, employees are assigned a monthly print budget. When they print, they use print points. A leader board promotes collaboration and competition identifying performance by user and department, based on print point budgets and point savings. In addition, the tool can be used to communicate suggestions such as using double sided printing or ways of saving energy. Rather than enforce use of the tool, a voluntary approach has proven to be most effective. Xerox says that early indications from organisations which have implemented the tool report reduced monthly page volumes between 15 and 25%. Xerox claims that the most success was where the benefits of the tool are clearly communicated by management. Tools such as the Xerox Print Awareness tool can be developed to encourage the use of digitisation and further minimising paper usage – for instance scanning documents to the cloud or enterprise content management (ECM) systems to improve business process efficiency. Another example of gamification also illustrates tangible financial benefits. UK gamification company G2G3 worked with Swiss Re, a provider of reinsurance and insurance products 5. Its myProductivity, web-based application encouraged Swiss Re employees to consume fewer IT-related services and drive down data storage costs. The customised platform achieved this through a series of games to encourage employees to take positive action by completing a challenge and being rewarded. Employees were incentivised with rewards that were converted into real cash for a honey bee charity in Africa. This led to an 87% participation rate and, according to G2G3, Swiss Re was able to cut $3m from its annual data storage bill within eight weeks. Using a gamification approach, it also encouraged Swiss Re employees to compete as teams against each other to see who could achieve the biggest cut in paper consumption. As a result, the total amount of printouts fell by 27%, leading to a decrease in paper consumption of 22.5% and cost savings of approximately $350,000. Gamification may still be in its infancy, but it does hold promise as a means to improve employee engagement. Undoubtedly the human factor is one of the most important elements in the success of a digital transformation. Although gamification can certainly play a role in supporting any transformation programme it is not without its challenges – not least of which is poor game design, which can lead to low employee participation. A first step to gamification is to focus on short term achievable goals, such as one that encourages responsible printing behaviour, for instance. This can pay dividends and potentially pave the way for broader engagement with digital transformation initiatives. Get in touch with Quocirca to find out more. Expert and actionable insight to inform business innovation and strategy.